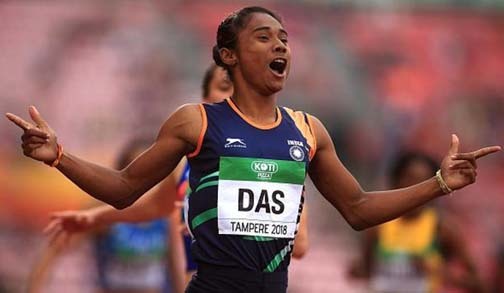 Hima Das qualified for the semi-finals of women’s 200 m early Tuesday morning at the Asian Games 2018 in Jakarta of Indonesia. Though Hima missed out on direct qualification for the semifinal for the women’s 200m event, but earned a spot as a ‘lucky loser’ as at the end of all the heats, she has the fastest time of all athletes who finished fourth. At her heats, Hima finished at the fourth spot with a timing of 23.47 seconds. Earlier on Sunday, the star sprinter from Assam, won silver the women’s 400 m race of Asian Games 2018 by finishing at 50.79 seconds breaking her all-time personal and national record. Eighteen-year-old Hima Das is the second athlete after Bhogeswar Baruah to have won a medal in Asian Games. Bhogeswar Baruah, an Arjuna Award winner, is a 800 m gold medallist in the 1966 Asian Games.